Vitamin B-12, also known as cyanocobalamin, is used medically to treat vitamin B-12 deficiency. It's also used as a supplement to increase energy levels and improve concentration. Vitamin B-12 may be administered by mouth, in the nose or by injection. You can inject it into a muscle, called an intramuscular shot, or under the skin, called a subcutaneous shot. Injectable B-12 requires a prescription from a doctor, but you may self-administer the shot at home. Thoroughly wash your hands before handling your supplies. Clean hands will limit contamination of the product and of the injection site. If you are giving a injection to someone else, wear latex gloves. Gather your B-12 medication vial, a 1 ml syringe and a 22- to 25-gauge needle that's 1 to 1 1/2 inches long. The larger-gauge needle is finer than the 22 and will provide the most comfort during the injection. Also, the needle needs to be long enough to reach the muscle of the person you're injecting. Attach the needle to the syringe. Make sure the needle locks onto the syringe by first inserting then turning it until it securely locks in place. Prepare the injection. Uncap the B-12 vial and wipe the top of it with an alcohol swab. Then draw an amount of air equal to the volume of your injection into the syringe. For example, if your dose is 1 ml, pull back the plunger on your syringe to the 1 ml mark. Pick up the vial and insert the needle of the syringe into the vial at a 90-degree angle. This will prevent coring--the introduction of pieces of the vial's rubber stopper into the vial. Inject the air into the vial and, after inverting the vial, draw the appropriate volume of B-12 solution into the syringe by pulling back the plunger. Withdraw the syringe and needle from the vial. Choose your injection site. 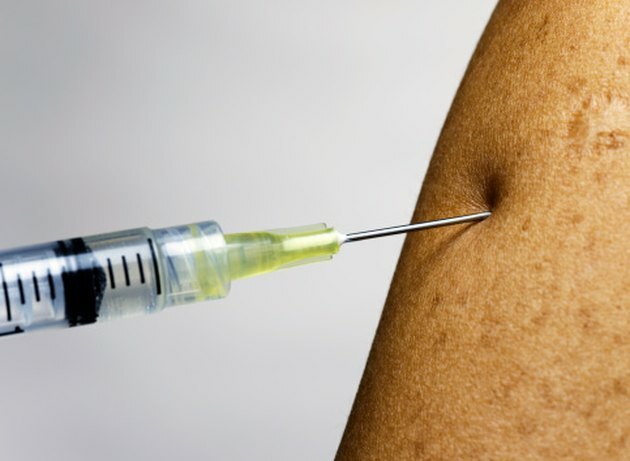 Intramuscular shots may be given in the upper arm, thigh or buttocks. Prepare the injection site by cleaning it with alcohol. Inject the medication into the muscle by inserting the needle at a 90-degree angle using a quick and smooth motion. Then depress the plunger, slowly releasing all of the medication into the muscle. Withdraw the needle and discard it in a sharps container. Apply pressure to the injection site using a cotton ball to reduce bleeding. Apply an adhesive bandage if needed. If you give the injection in the arm, always choose the least dominant arm, because you may have residual soreness after the injection. To avoid fingersticks, never recap the needle.